A man of the match performance from Zach Bay Hammond helped Carlow Kilkenny crush some Kerry resistance and bounce back to winning ways. 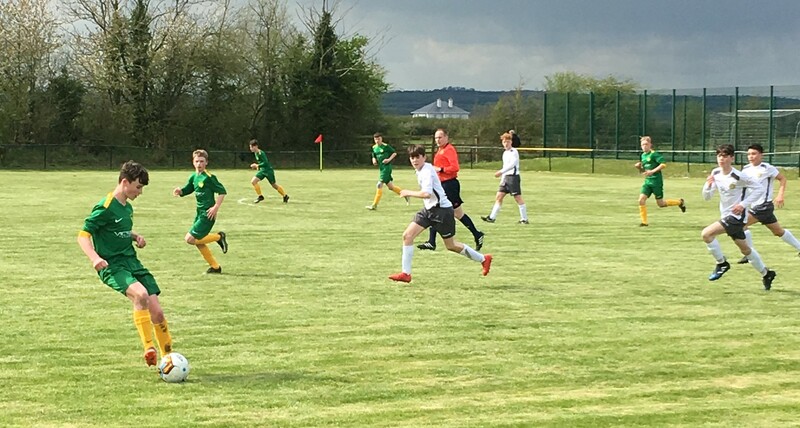 The former Thomastown United player scored twice as Mark Ross’s side picked up all three points in their under-15 Airtricity League clash with the Munster side in Derdimus on Sunday. Hammond’s second goal, which came three minutes from time, ended a spell of Kerry pressure in emphatic style. He showed great awareness to break free on the right and finish a Daryl Mtumba cross from the tightest of angles. Hammond also struck in the early stages of the first half, showing pace and precision to race on to goalkeeper Mark McCarthy’s booming 15th minute kick-out and lob the outrushing goalkeeper Arron O’Sullivan. The home side kicked on and almost doubled their lead in the 18th minute. Hammond created the chance this time, making space on the right to whip in a cross for Rory O’Dowd, but O’Sullivan made a good save to stop the midfielder’s acrobatic effort. That was a let-off for Kerry, who stepped up their own efforts to hit the net. Cillian O’Shea and Ronan Teehan combined to carve the home defence open after 26 minutes, but Adam McCarron made a timely block to prevent O’Shea from getting a clean shot off. Kerry went even closer to getting that equaliser seconds before the half-time whistle. Robert Vasiu did the damage with a teasing diagonal ball, but it was just beyond the reach of both Sean Kerdeski and Ronan Teehan. While Kerry kept hunting for a goal throughout the second half it was Carlow Kilkenny who came closest to finding it. Daryl Mtumba seemed certain to make it 2-0 when Noah Quinlan headed an Adam McCarron free into his path, but he couldn’t make a clean connection. Kerry escaped that time but were finally sunk when Zach Bay Hammond made it 2-0 late on. Jake Ffrench Davis completed a good day for Mark Ross’s side when he scored their third goal in the final seconds of normal time. However, it was a mixed day for the youngster, as he was sent off in injury-time. Next up for Carlow Kilkenny is a meeting with division leaders Cork City on May 12. Carlow Kilkenny: Mark McCarthy; Jake Haughney, Adam McCarron, Fionn McCaffrey, Cian Byrne; Jack O’Neill, Niall Rowe; Eamon Lalor, Rory O’Dowd, Darren Lawlor; Zach Bay Hammond. Subs: Ben Goodwin, Noah Quinlan, Timmy Clifford, Daryl Mtumba, Jake Ffrench Davis. Kerry: Arron O’Sullivan; Cian Brosnan, Zach Beehan, Alain Beaujoai, Cian Clancy; Cillian O’Shea, Ronan Teehan, Caolan O’Connell; Sean Ryan, Sean Kerdeski, Cian Wright. Subs: Sean Dillane, Ryan Guerin, Sean Horan, Robert Vasiu, Philip Evans, Maurice O’Connell, Jack McGillicuddy. Referee: Jason Moore. Assistants: Eoin Walsh, Mitch Corrigan (all Kilkenny).